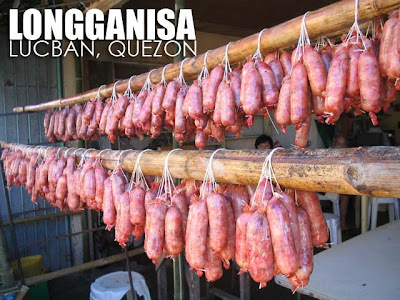 Quezon & Laguna: Viva San Isidro Labrador! 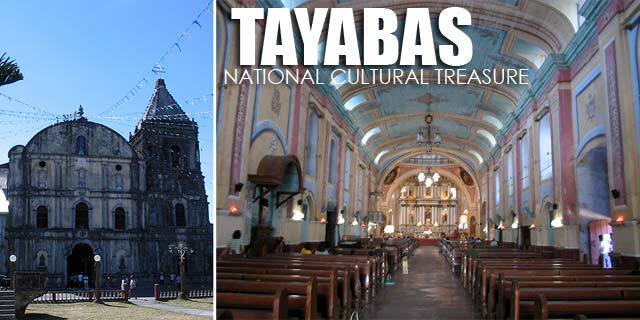 May 15 is an important day in three towns of Quezon Province, namely Lucban, Tayabas and Sariaya. It is the feast day of San Isidro Labrador, and each town commemorates this day with their own unique celebration. 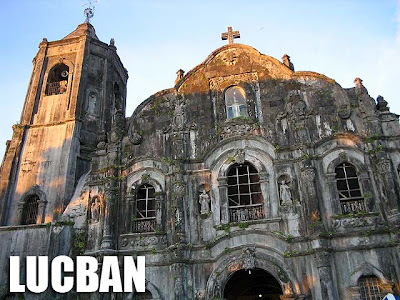 Our plan was to visit Lucban in the morning and Tayabas in the afternoon. But a twist of fate would make the trip more exciting and worthwhile. I left Manila with some photographer friends at 3 a.m. Early you say? I was told that by 6 a.m., it would be difficult to enter the town since people really come in droves to witness the Pahiyas, one of the more famous festivals in the country. If you are familiar with Discovery Channel's The Travellers, it was the festival they featured when the Philippines was in focus. We arrived in Lucban shortly before 6 a.m. and finding parking was already a big challenge! The streets were so narrow and you had vehicles parked on both sides. Finally we found a parking space and from there we took a walk to the Lucban Church where Mass was about to begin. Although Lucban is known for the San Isidro fiesta, the church is actually dedicated to San Luis Obispo. Pahiyas is a thanksgiving festival for a good harvest, where residents of Lucban dress up their homes with produce, flowers and plants, hats, and brightly-colored kiping, rice paste wafers shaped like leaves. Pahiyas actually means "decor" which is an apt term for the elaborate, lavish and imaginative house decorations created for the festival. After the Mass, at 7 a.m., the procession begins and the images of San Isidro Labrador and his wife, Santa Maria Torribia de la Cabeza, are brought around the decorated homes, accompanied by a marching band, to assure farmers of more bountiful harvests in the coming seasons. Lucban is also known for its longganiza and weaving trade. That's why it is famous for hats. And I bought a lot of them! Hehe! I like wearing the haciendero hat which Lucban is known for when I'm in formal or semi-formal attire and I know that I'll be out in the sun for quite a while. After three hours of walking around, we decided to move to Tayabas. Although we planned to be there at 3 p.m. in time for the hagisan ng suman which I will discuss later. We drove out of the town only to realize that we took the wrong route, and had to re-enter the town to go to Tayabas. Since the traffic was really bad, going back in Lucban was out of the question. Taking a longer route would have been more practical than driving in traffic. At least we could see more. The first option was to go via Mauban. But the sight of a dirt road discouraged us since the prospect of driving my car on approximately 50 km of dirt road was unimaginable! So the next option was the route via Laguna which would literally take us around Mount Banahaw. Since there were a lot of attractions along the way, there was a lot to look forward to. First stop was the town of Majayjay, Laguna. Before we reached the town, we stopped by a bridge along the way to take photos of the scenery. 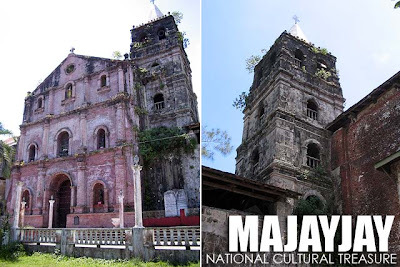 We went to Majayjay to visit the Church of San Gregorio Magno, one of the 26 colonial churches declared by the National Museum as National Cultural Treasures. After Majayjay, we drove past Liliw, a town known for its slippers, and proceeded to Nagcarlan which is most known for the Nagcarlan Underground Cemetery, declared by the National Historical Institute as a National Landmark. Our first stop in town was its centuries-old Church of San Bartolome. The church itself is an NHI-declared historical site. 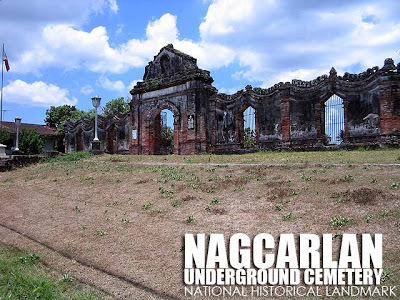 Just a short drive past its charming town presidencia and waterworks fountain, was the underground cemetery, the only one of its kind in the Philippines. Maybe the Franciscan friars who created this structure wanted to replicate the catacombs of Rome! I was astounded by the brick fence as the design was very Asian, and made me feel as if I were somewhere else. It actually reminded me of the royal tombs in Hue, Vietnam. It's a pity we could not take photos inside. Flash photography contributes to the decay of the site. But even if your flash is turned off, they won't allow it. I guess it's a general rule for generally hardheaded Filipinos. Hehe! From Nagcarlan, we drove towards San Pablo where we decided to have lunch. Since it was already 1 p.m. and scorching hot at that, we decided not to take photos anymore and move on to Tayabas since we might miss the procession. From San Pablo, we drove past Tiaong to Sariaya. We had no intentions of stopping. But the sight of elegant and huge art deco houses was just irresistable! We were not disappointed. The architectural heritage of this town was previously unknown to me until I saw it. It was nothing but astounding! The houses were a result of the coconut boom during the First World War when coconut oil was a sought after commodity in the global market. 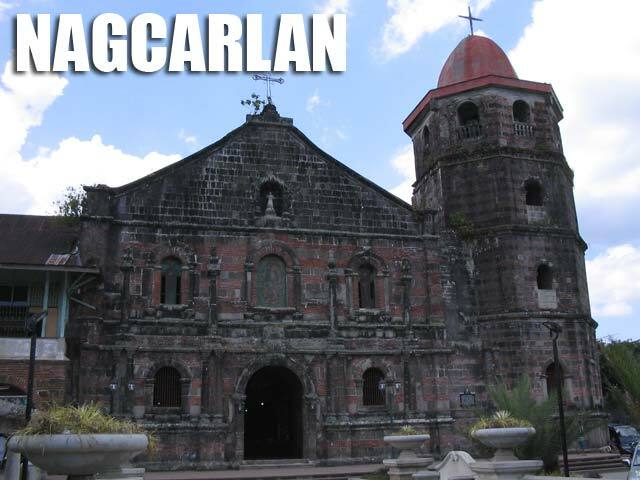 As a result, Sariaya became a very prosperous town. And this is evident in the art deco houses that dot the area around its town plaza. Aside from being intricate and well-preserved, they are numerous! Some of the houses were opened to visitors for the May 15 celebration. There was an entrance fee of P20 per house, the proceeds of which went to Tuklas Sariaya, the local heritage conservation organization of the town. The heritage houses, coupled with the monumental art deco municipal hall, plaza, and church with its two conventos (the one on the left was definitely built during the Spanish colonial period), indeed make Sariaya rank among our best-preserved heritage towns which include Vigan, Ilocos Sur; Taal, Batangas; Silay, Negros Occidental; Pila, Laguna; and San Miguel de Mayumu, Bulacan. Bacolor, Pampanga would have been in this list had it not been covered by lahar in 1995. The local celebration in Sariaya is called Agawan. And just like Lucban, the houses are adorned with fruits and vegetables, rice stalks, hats, fans and brooms, sans the kiping. The festival is a way for the townsfolk to share their blessings. 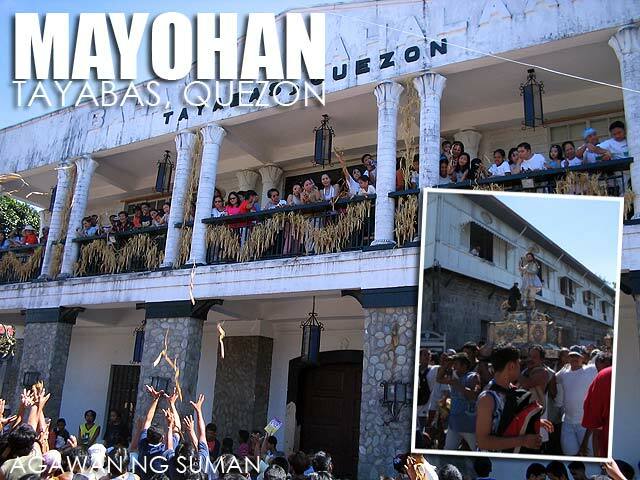 After the procession of the image of San Isidro, the agawan begins as the items used to decorate the house are thrown to the crowd on the street. It was now off to Tayabas after that "refreshing" stop under the hot summer sun. And we arrived just in the nick of time since the procession was about to start! Cheers were heard from the plaza as the image of San Isidro Labrador was brought out, carried by devotees in this all-male procession. I would consider it a much smaller yet livelier version of the Quiapo procession. What makes this procession a unique part of the Mayohan sa Tayabas, the Tayabasin celebration of the feast of San Isidro, is the hagisan ng suman. As the image passes a house, suman is thrown by its dwellers. Devotees then rush to catch the falling suman which drops from the sky like rain. It is believed that the more suman one catches, the bigger the harvest for the coming season. So expect to be shoved when the suman starts to fall, as I was shoved while taking photos! Try to stay away from the suman if you don't want to get pushed. Hehe! After the procession, we took photos of the Basilica Minore of St. Michael the Archangel, another of the churches declared as National Cultural Treasures. 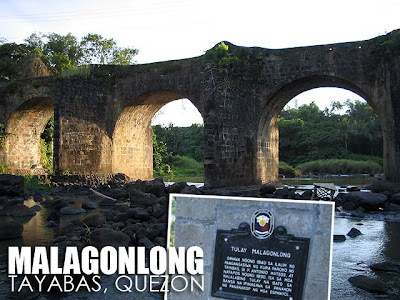 Other attractions in Tayabas include the Casa Comunidad, a National Landmark, and its stone bridges. We called it a day at 4 p.m. and decided to take the Lucban route to Manila seeing that the Sariaya route was already clogged. Lucban was 10 km away and it was moving fast. But just as we got close to the town proper, everything just stopped. After 30 minutes, we decided to turn back and use the Sariaya route instead. When we entered Tayabas, the procession, which had been moving around town for three hours now, was about to cross the street. And we had no choice but to go via Lucena. 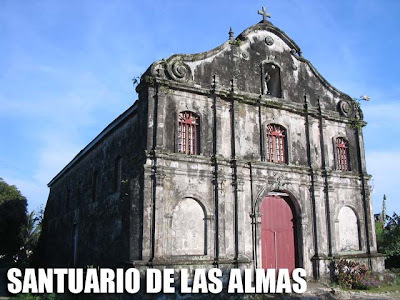 On the way to Lucena, we saw this quaint old chapel. And as always, we stopped to take photos. It was then that we decided to try to find the Malagonlong Bridge, a landmark which Tayabas is known for, as our final stop for the day. After asking around, we found out that this charming stone bridge was along the road to Mauban, Quezon, the road we tried to avoid! Hehe! Being adventurous, we decided to visit the bridge and go home to Manila via Mauban, thus circumventing Lucban traffic. The bridge was a indeed sight! If not for the new bridge constructed beside it, it would have been nothing but perfect! We went down to the river to take better shots of it. We were literally on stepping stones in the middle of the river. Anything for good shots! Hehe! As it was getting dark and not knowing what was ahead, we decided to take the Sariaya route again. Maybe the traffic was much lesser since the festivities were over. But as we were about to exit Lucena, it was a standstill again, and three lanes tried to squeeze themselves into one! Oh you know how Filipino drivers are, illegal counterflows and shoulder driving just to get ahead! I was just too exhausted so we decided to have dinner at SM City Lucena. We left at 9 p.m. hoping there would be no more jam. But traffic was still slow. At least it was moving this time. To make the long story short, we got back in Manila close to 12 midnight. I had been driving for almost 24 hours. But it was worth it. All I could do when I got home was sleep! 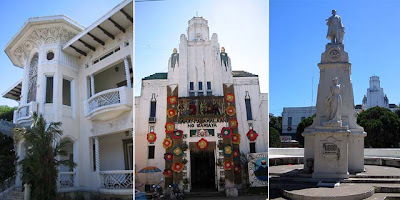 thanks for including/ranking sariaya with the rest of the historical towns. fortunately the townsfolk, (obviously, not the government of sariaya.) 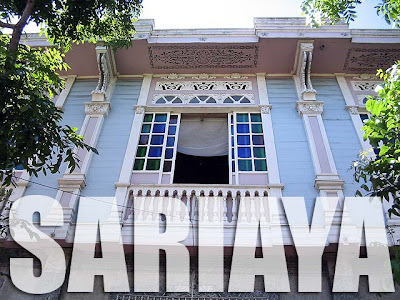 are spearheading a massive conservation project of the ancestral houses of sariaya, which you yourself said are histoprical gems, but some of the owners of the houses are uncooperative. i am really disppointed that some of the houses are deteriorating due to neglect. others try to re-model. Only a few are well preserved, including the Juan Nakpil house, which you have shown in your photograph above. One of the houses are for sale, but the owners explicitly declared in the contract that no part of the almost 80 year old house shall be remodeled. hopefully, all will not be lost. You should have remained in SARIAYA that afternoon because it was where THE ACTION IS!the Agawan or in Sariayahin terms, the HALBUTAN encapsulates the true spirit of giving & sharing of San Isidro de Labrador!As crazy and wacky as the La Tomatina of Bunol, Spain, it is the most expressive and expressed form of hospitality anywhere, aptly termed as a HAPPY PANDEMONIUM! 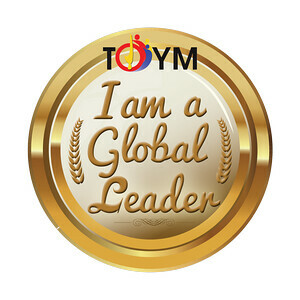 After partaking of Sariaya's sumptuous food, you can have your fill of a wonderful, sweaty and exciting Take Home experience that will last you a lifetime, as in fruits,veggies, money, bread, etc. being literally thrown at your feet while those gently swaying bountiful bamboo trees called BAGAKAYS are allowed to fall on the ensuing grabfest at the same time, as soon as the Poong San Isidro has blessed it, captured on camera and videos for posterity. But you can return this coming May 15, 2007, sans the election brouhaha, and get to experience this one-of-a-kind centuries old Sariaya celebration! 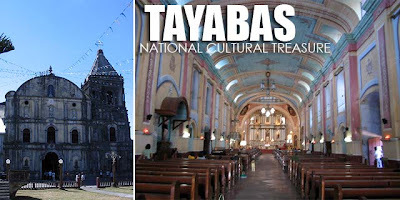 You can even visit the church complex that includes the convent or the Residential Museum, the Devotional Park and the Franciscan Museum called the Museo Ng Debosyon At Buhay to feel the town's religious heritage which influenced our way of life and shaped Sariayahin character.Likewise, sample Sariaya's pasalubong items like Tamales, Broas, Apaz, Pinagong, Mazapan de Buco and Pastillas in various flavors. That way, Sariaya will not be just another curious town along the Maharlika Highway! Yes, that is right. We missed that part. I'll try to pass by again this year but I might be out of the country then.